Hard to believe, but it’s been three years since our little Happy went on to the world that comes next, to be with Grandma and run and play with the other dogs, and wait for us to catch up. It was July 8, 2009. In this photo, Happy is having lunch just a few hours before the vet came to help her cross the bridge. I think lunch was her favorite, “oven baked” chicken from Subway. * She doesn’t look sick; she looks hungry and profoundly sweet and patient. But she was a pretty sick little doggie. Happy didn’t write poetry, as far as I know. But she was a blogger. 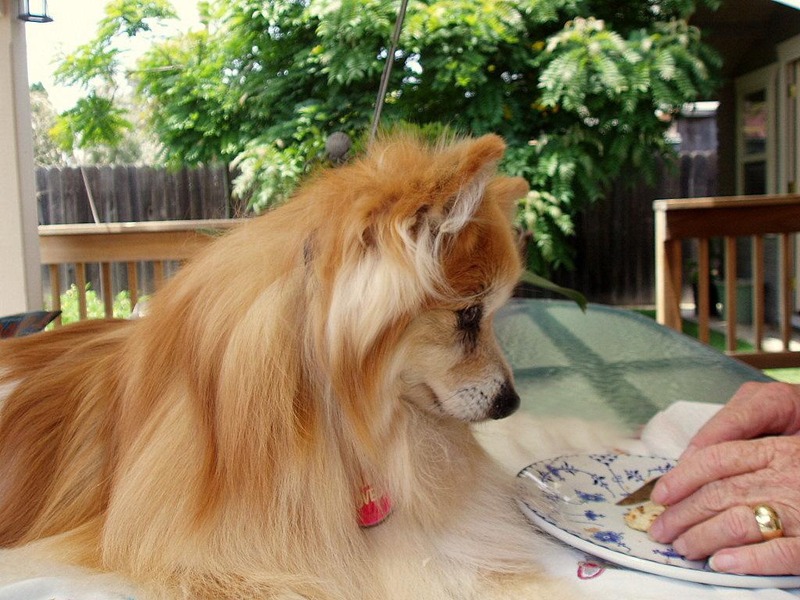 My sheltie Tasha was a poet though. Here’s a poem for memory, written by Tasha in 1999. For the record, I didn’t mind Tasha sleeping on the bed or the quilt. I think she made that up for artistic effect. 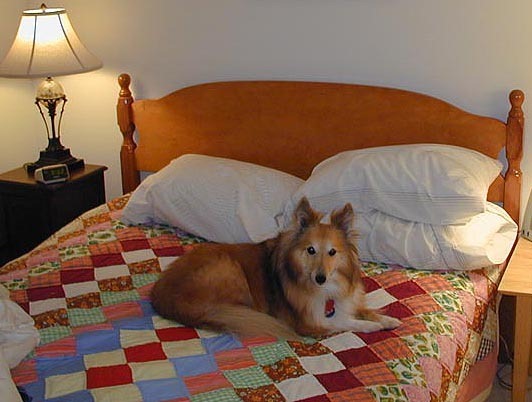 This photo is of Tasha on the bed, about a year after she wrote the poem, when we moved to our new house. but the man isn’t watching. love if she lives with a poet. * For a mood lifter after this heavy post, here’s a video of Hank Green singing The Subway Where I Used To Go. And if you don’t know why that’s funny, here’s a version of the original song. This entry was posted in dogs, photos, poems by Kyle Kimberlin. Bookmark the permalink.